Home » Multi level on a stunning ravine lot! Multi level on a stunning ravine lot. 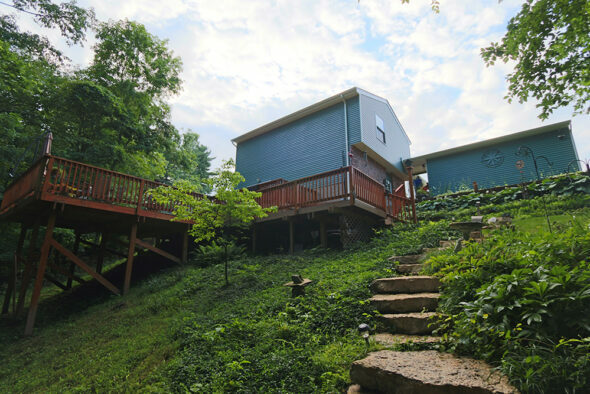 This home is perched on the side of a hill backing to Pine Quarry Park’s ravine. This home is perfectly maintained and boasts laminate floors thought the main living space, oak cabinetry, updated baths, new roof and fresh exterior paint. The real attraction here is the spectacular views from the multi level deck, just walk out the glass doors of the family room and you are in a tranquil world full of nature. Pictures at the end are of pine quarry park which is less than 50 feet away.